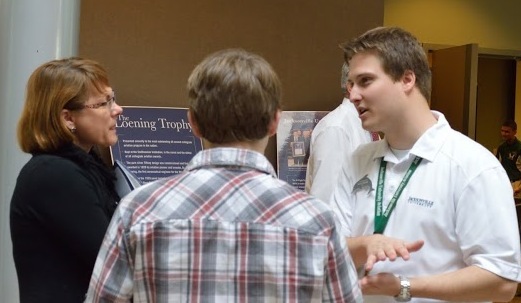 JU Aviation Management student Steven Paduchak, right, an Aviation Ambassador for the Davis Aviation Center, speaks with a prospective student and parent at the JU Aviation Open House in March 2014. 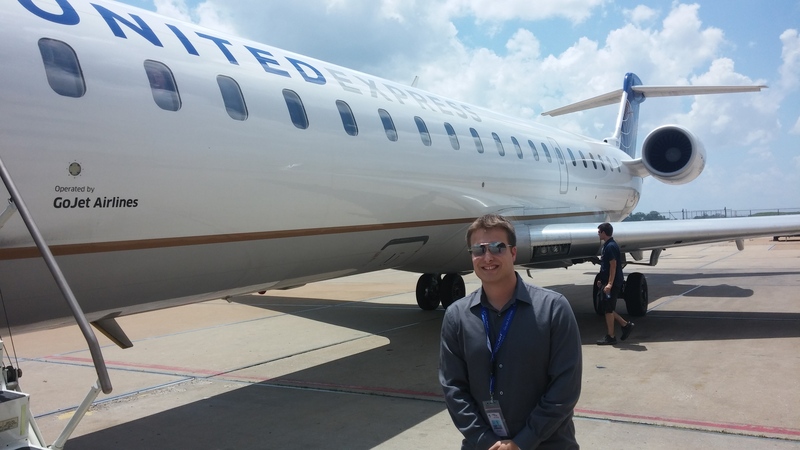 JU Aviation Management student Steven Paduchak stands next to a CRJ-700 aircraft during his GoJet Airlines internship in St. Louis. I’ve always wanted to be involved in aviation. Growing up, I flew out to the West Coast each summer to visit family. As I walked through various airports nationwide, I would see different kinds of people, from businessmen and women to families, athletes, politicians, celebrities, military personnel and people of cultures from all around the world. Knowing that at the end of the day, somebody I passed could either be someone from down the street or on the other side of the planet, I was captivated and drawn to the industry. Working as an intern at the airport back home in Ohio only sealed the deal. I wanted to see what my future career would consist of, and it certainly paid off. Through a mutual friend, the prestige of Jacksonville University’s program was brought to my attention early on in school. I knew there was something special about it. 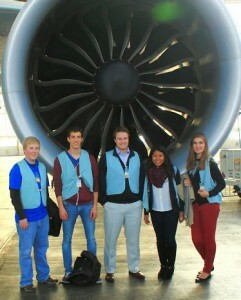 JU MBA student Daniel Pruitt (far left) and Aviation Management student Steven Paduchak (center) touring Lufthansa Airlines with other aviation students in Germany. 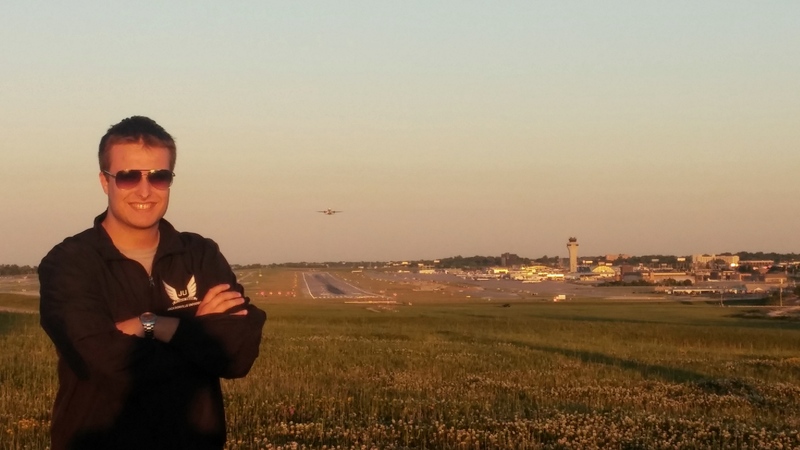 After my freshman year, I made the difficult decision to leave the Midwest and come down to JU to continue my education in aviation. Having the opportunity to meet so many people in the industry and take part in various internships across the country has been a direct result of my family and JU’s investment in me. When I entered my junior year, I thought heavily about what I could do to give back to the university that’s given me so much. I approached the Associate Director of the Davis Aviation Center in the Davis College of Business with this dilemma, and in March 2013 he appointed me to become one of his Aviation Ambassadors. I now represent our aviation program with great pride. We are humble and dedicated students who lead by example, and we want to make sure the program is filled with opportunities for all incoming classes. My philosophy of giving back to JU is displayed through being an Aviation Ambassador. During our annual Open House, I take pride in speaking with incoming students, knowing they not only represent the future of JU, but of the aviation industry in itself. 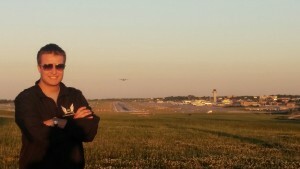 JU Aviation Management student Steven Paduchak catches a few planes landing and taking off up close this past summer. I had the opportunity to live in St. Louis this past summer as part of a Davis Aviation Center internship. I worked for GoJet Airlines, a regional affiliate of United and Delta, and I was exposed to almost every aspect of the airline’s operation. I’m still involved with the air carrier today, helping represent its internship program, and it coincides with the company’s initiative to establish a collegiate presence. I reach out to students looking to further their experiences in airline management, and I enjoy helping others gain opportunities that were made available to me. My passion for aviation and desire to give back has now gone nationwide, and that’s something I’m very thankful for. This past fall, I had the privilege of being in Europe, along with JU MBA student Daniel Pruitt, as international students studying at the European Business School Business School in Frankfurt, Germany. What stood out for us the most were the different cultures and backgrounds from which students came. While at one of the biggest international universities on the continent, we made friends with people from all over the world — friendships that Daniel and I will keep the rest of our lives. Jacksonville University has made all of this possible for me. Over the course of my time as a Dolphin, I made the best of friends, met aviation professionals, traveled the world as an international student and represented the aviation program with tremendous pride. After graduation, I hope to come back as an alumnus and join JU’s Aviation Advisory Board to continue helping the student body. Dolphin Nation has given me long-term opportunity; what will it do for you? Jacksonville University’s Davis Aviation Center in the Davis College of Business has been preparing students for business careers in the aviation industry for more than 30 years. In 1996, Jacksonville University established a one-of-a-kind training partnership with an airline’s training center, Aerosim Flight Academy (formerly Delta Connection Academy), to educate and train future airline pilots. Jacksonville University is one of the first 30 universities in the world with bachelor degree programs accredited by the Aviation Accreditation Board International (AABI) and one of 36 universities in the U.S. selected by the Federal Aviation Administration to offer an Air Traffic Control Program under the FAA’s collegiate training initiative (CTI). To view pictures and videos from the Flight Team competition, visit us online on Facebook and YouTube. To follow aviation at JU, visit www.ju.edu/aviation or call (904) 256-7895.